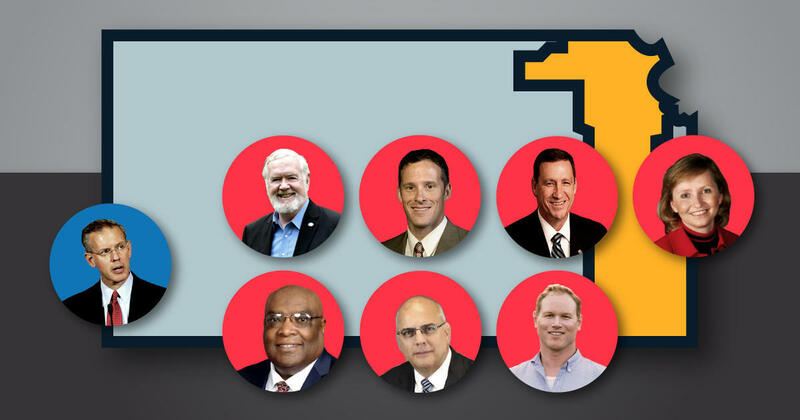 Whoever wins the Aug. primary will take on Paul Davis, a well-funded Democrat who lost the 2014 general election race for governor to Sam Brownback. In that race, he beat the Republican in the 2nd Congressional District. Six of the seven Republican congressional candidates gathered recently for a forum in a church basement in Eudora. The organizers had set up a folding table, but there were so many candidates that they couldn’t fit behind it. Two sat off to the side. Despite the number of candidates, the GOP hopefuls vary little on the major issues. Instead, there’s a lot of agreement. Take, for instance, immigration — and whether the United States should build a massive wall on the southern border like President Donald Trump wants. There’s similar agreement among the candidates on other big issues, including abortion and taxes. That sameness makes picking a candidate a little more difficult for voters such as Edmond Rea. He came to the Eudora forum because he’s a dyed-in-the-wool Republican and he wanted to see the candidates face-to-face. Rea said the economy, immigration and border security are important to him, and he wants someone who will support the president and his agenda. “President Trump is just taking it from all sides right now, and he needs more supporters,” Rea said. The candidates in this race are in step with the president. They’re trying to differentiate themselves while at the same time appealing to the conservative voters who helped put Trump in office. Republican state Sen. Steve Fitzgerald, of Leavenworth, touts his conservative credentials and his outspoken, strict stance against abortion. He said he’s ready to serve in Congress based on his military, business and elected experience. Another state lawmaker in the race, Sen. Dennis Pyle of Hiawatha, said he’ll work with others to get things done, but he’s also prepared to clash with party leadership when necessary. He points out that he challenged Jenkins for her seat several years ago when he thought she wasn’t voting the right way. Tyson, who owns a ranch in Linn County, is touting her endorsement by the Kansas Farm Bureau and her background in technology. She said she’s worked on tough budget and tax issues while in the Legislature and can take that experience to Washington. The race isn’t just playing out on debate stages like the one in Eudora, it’s also hitting the airwaves. And one candidate will likely be mentioned on TV more than any other. Steve Watkins, a political outsider and veteran, will have a blitz of TV ads paid for by a super PAC funded by his father, a Topeka physician. The elder Watkins has poured hundreds of thousands of dollars into the super PAC. Fitzgerald has been targeting Watkins over the funding and what he believes is an insincere Republican pedigree. Watkins, from Topeka, said there’s a simple explanation why he’s a target for Fitzgerald. In the race, Watkins is tying himself to another person who ran as a political novice, Donald Trump. He calls the other candidates career politicians. “If we want an outsider, and if we want somebody to help Donald Trump drain the swamp, there’s one candidate. That’s Steve Watkins. I’m proud of that,” he said. Former Kansas House Speaker Doug Mays of Topeka joined the race saying he could keep it in Republican hands. He said at a forum last month in Leavenworth that there’s a lot of pressure in Congress to vote with leadership. He said he proved during his time in the Legislature that he’ll stick to his guns. Jones is another candidate touting military experience. He lays out his priorities as fiscal reform, national security and fighting the opioid epidemic. He said he joined the race because too many politicians are focused on their own interests. Fields is a retired federal law enforcement officer and he’s selling himself on core conservative values, including limited government, personal responsibility and constitutional rights. “It is my firm belief that the 2nd Congressional District of Kansas deserves a representative who will be held personally responsible for limiting the impact of government,” reads one of his campaign cards. With the candidates agreeing on so many issues, it makes sense that they’re trying to differentiate themselves in other ways, according to University of Kansas political scientist Patrick Miller.